Semia Payasam is another wonderful pudding just like Pal Payasam (Rice and Milk pudding) that is often featured at feasts in South India; in fact no feast is complete without at least one kind of payasam. It is one of our family favorites and I love making it often. I like to offer payasams in general as a dessert as they tend to be the healthier with a low fat and low sugar content compared to other desserts. They are also easy to make with the least amount of prep work. Semia are fine noodles made from wheat just like vermicelli; they are called 'seviyan' in Hindi. Usually the payasam settles in the pan while cooking and is burnt very easily. I figured out the secret to making great payasams without all the constant stirring! One time I added the sugar to the milk by mistake but went ahead with the payasam rather than toss out the sugary milk. Well, that accident proved very useful! Now any time we want payasam, I just add the sugar to the milk at the beginning and forget all the stirring and fuss. No more burnt payasam :)! I have tried this method many times and the results are incredible without exception; I cook semia, sago (tapioca), and rice payasam the same way. Now the payasams turn out superb. Happy May 1st! Celebrate with Semia Payasam! Amma always made some type of payasam or a sweet dish on the first days of each month when we were children and Semia payasam was one favorite! New Month's Day is always celebrated just like New Year's Day even if not as elaborately; it is another opportunity to start anew. Roast the semia noodles in a dry skillet stirring constantly until golden. Alternately, roast the noodles in a 350 degree oven for about 10 minutes or until golden. Cool slightly. Meanwhile bring the milk and sugar to a boil. Simmer for 30 minutes to an hour until the milk is reduced a little and looks creamy. You can simmer the milk even longer if desired for a creamier result. The longer you simmer the milk, the creamier it gets and the milk sugars caramelize and give the payasam a great flavor and color. Add the toasted noodles to the simmering milk and stir well to prevent lumps from forming. Turn the heat to low and simmer until noodles are soft stirring occasionally. Crush the cardamom pods and collect the little black/brown seeds; discard the skins. Crush the cardamom seeds and saffron strands together with a teaspoon of sugar using a mortar and pestle to a fine powder; the sugar helps to grind the spices. Sprinkle the spices over the payasam and stir well to combine. Cover. Heat the ghee/vegan butter substitute and cook the cashew pieces until pinkish; add raisins and stir until raisins puff up a little. Remove from heat. 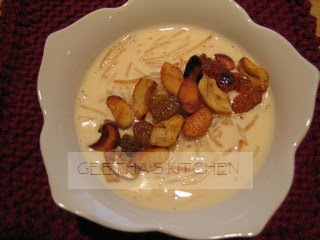 If you are serving the payasam right away, stir in the cashews and raisins and serve hot, warm, or cool. The nuts and raisins provide a nice contrast to the creamy soft payasam and offer intense pockets of flavor and richness. When planning to serve the payasam later, I usually reserve the cashews/raisins and sprinkle them on top of each serving because I prefer the cashews to stay crisp. Note: Although it is traditional to add cashews and raisins to the payasam, you can omit them; I sometimes leave them out because not everyone is very fond of them. Corn Cakes are utterly delectable and very easy to make. Although they can be served any time with your favorite accompaniments, they are scrumptious with Tomato Chutney. Some even like it with ketchup! Serve the corn cakes as a light snack or lunch or dinner with roasted corn chowder or another soup, any salad or raita. Sambar Powder is a classic South Indian spice mix that even people who profess to dislike "curry" absolutely enjoy; it is readily available in Indian markets. My friend Linola is one such example who would probably balk at the thought of going to an Indian restaurant, but sprinkles Sambar Powder quite liberally in all sorts of dishes except of course her fabulous apple crisp :)! 230 Calories; 7 g Protein; 39 g Carbohydrates; 3.5 g Fiber; 5.8 g Fat. Combine the w. w. flour, milk, and half the corn in a blender or food processor and process until almost smooth. Pour into a mixing bowl. Stir in the remaining corn kernels, the sprouts, corn meal, rice flour, and salt and pepper to taste. Mix well. Stir in the chopped cilantro. The batter should be fairly thick but easily poured from a spoon; add more milk or water to adjust the consistency of the batter. Heat a skillet or griddle and brush with oil. Drop a small ladle of batter for each pancake; make 2 or 3 pancakes at a time depending on the size of the griddle or skillet. Drizzle a few drops of oil around the pancakes, and cook until set. Carefully turn over the cakes to cook the other side. Cook until golden brown. Serve hot with the Tomato Chutney, salad or raita. Variations: Mix 1/2 tsp (or to taste) of Sambar Powder into the batter for a nice change. And/Or stir in 1 small grated zucchini or carrot or a little of both for beautiful color, delicious flavor and added nutrition. Adjust the seasoning of the batter when adding extra ingredients. Molagushyam is another classic Kerala stew that we adored as children. Although it does not sport an impressive list of herbs or spices, it is simply divine and satisfying. I have only seen it served for family meals and never at any formal occasions. It definitely belongs in the homey, comfort food category. It is one of Amma's favorite dishes too; she would forgo the traditional rice in favor of enjoying a little more molagushyam! I remember that although she preferred using the Indian 'thali' or stainless steel plate instead of porcelain plates or bowls in general, she would bring out the wide soup bowls with a big smile to serve the molagushyam :). According to Ayur Veda, mung beans are restorative and strength building. Mung bean, especially the split yellow dal, generally leads the list of the "pathiam" or convalescent foods which are the traditional get-well foods which are easy to digest and nutritious. Mung beans provide high quality nutrition with great taste and easy digestibility especially for people recovering from an illness. Beans are low in fat but high in fiber (both soluble and insoluble), good sources of protein, B vitamins, Iron, and other trace minerals. Unlike other plants, beans also enrich the very soil they grow in by a process called nitrogen-fixing whereby the bacteria present in the bean plants pull out nitrogen from the atmosphere and fix it in the soil so that it is available to subsequent crops grown at that same site. I remember that my Thatha (grandfather) used this principle to do crop rotations to enrich the soil; he would plow the old bean plants which he called "green manure" into the soil after they were finished to start the planting cycle all anew. We got wonderful beans to eat and fertile soil too for future crops - all without the use of synthetic fertilizers which are harsh on the environment. Very Earth-friendly indeed! Caveat: Do remember that the taro (Chembu/Cheppan kizhangu in Malayalam/Tamil, Arbi in Hindi) must be well cooked until soft. See note of caution about taro/arbi in Puli Kuthi Poduthul. Sort the beans to remove any rocks or other debris. Lightly roast the mung beans without any oil in a skillet constantly stirring until just fragrant; cool. Wash well when cool and place in a large heavy bottomed pot with fresh water to cover; break the dry red chilies in half and shake out and discard the seeds and drop them into the pot. Bring to a boil, turn down heat and simmer until soft (about 40 minutes on stove top). Alternately cook the beans in a pressure cooker according to manufacturer's directions; usually it takes about 15 minutes or so. Wash and dry the vegetables. Peel only the outer green skin of the banana; cut into half or quarters lengthwise and slice diagonally at 1" intervals. Peel the arbi roots and cut in half so the pieces are approximately the same size as the banana pieces. Trim the ends of the moringa pods and cut them into 2" long pieces. Add the vegetables, the turmeric, and salt to the soft mung beans and simmer covered until the vegetables are almost tender (about 20 minutes). Grind the pepper and cumin to a fine powder and sprinkle over the beans and veggies. Simmer another 10 minutes or until the vegetables are soft. Crush the curry leaves in your hand by squeezing them to release their aroma and place on top of the molagushyam. Pour the coconut oil on top and cover immediately. Let sit for 10 minutes for the flavors to develop. Serve hot on its own, over plain hot rice, with chapatis or as desired. Variation: Other mild vegetables such as the yard long beans or zucchini may be added to the molagushyam along with the cumin and pepper and simmered until tender. In Kerala, a true yam called Chenai also is a main ingredient. Note: The moringa pods are eaten in a similar fashion as artichoke leaves; gently squeeze the pieces to open up into 3 sections, bite firmly onto one section at a time and then scrape off the flesh by pulling between your teeth while firmly holding on with your fingers - it is a lot easier to do than describe. Channa Payesh is an easy, breezy recipe - a wonderful make-ahead dessert based on freshly made Indian Channa or Paneer Cheese. If you use the ricotta cheese or store-bought paneer, there is absolutely no cooking involved at all! It is utterly divine with fresh berries, mangoes, peaches, etc. Cream the ricotta cheese with the sugar until light and creamy in a food processor. If using paneer you may need to use a few spoons of cream to moisten as necessary. Stir in the rose or kewra water and the almonds and mix well. Cover well and chill for at least 4 hours or overnight. Spoon into pretty dishes- an ice cream scoop works great for this; add fruits if using, and sprinkle with a little of the chopped pistachios. Decorate with the rose petals (make sure that the rose petals are from pesticide-free bushes) and serve cold. Here is a Kerala classic that is at home with fancy feasts or modest meals. My sister won a prize when she entered this recipe at the Mango Festival! According to my sister 'Parikkai Fry' (Bitter Melon Stir Fry) is the perfect dish to balance and accompany the sweet Mango Pulisseri :). Mangoes are returning after a long winter and now is the time to try this recipe. No feast in Kerala is complete without Mango Pulisseri especially during mango season! Another one of our childhood favorites that we were always happy to eat! Firm mature mangoes work best for this curry. Whether or not you add sugar depends upon the sweetness of the mangoes and/or how sweet you like the curry. Taste a piece of the uncooked mango first to decide. We like the pulisseri tart or sweet. With the sweet one it is nice to serve parikkai fry; with the tart one I like to serve some type of paruppu usli curry (sautéed vegetables with steamed and seasoned dal). Wash, dry and peel the mangoes into medium sized chunks scraping every bit of the flesh from the seeds; discard the seeds. Cook the mangoes with the salt, turmeric, 1 cup of water, and sugar to taste if desired in a medium sauce pan until soft (about 10 minutes). While the mangoes are cooking, grind together the coconut, green chilies and the yogurt together until smooth. Add the coconut mixture to the mangoes and cook on medium heat for about 5 minutes. Remove from heat as soon as the curry begins to foam and rises up a little. DO NOT BOIL because boiling will cause the yogurt to curdle. Heat the oil in a small pan and add the red chilies, mustard and methi seeds. When the seeds begin to pop, turn off the heat, add the curry leaves quickly and cover. When the oil calms, add the Thalippu to the curry. Stir well before serving hot or warm over plain rice. Brown Rice and Barley Pongal is a very healthy and delicious food. I make it nonfat (see the directions below) so that individuals can decide to add ghee/butter if they choose. I love to include barley in everyday cooking as much as possible. Pleasant tasting barley grains are a good source of B vitamins and soluble fiber that helps reduce cholesterol and lowers your risk of heart disease. According to Ayurveda principles, barley is good for the reproductive/urinary tract health especially in women. Barley tea or water is a highly recommended beverage to prevent swollen legs and feet for pregnant women in Southern India. Roast the dals together except the karamani in a 350 F oven or in a skillet without any oil until fragrant; just lightly golden. Set aside to cool. Wash thoroughly the rice, barley and karamani together and drain well. Heat 8 cups of fresh water to a boil and stir in the rice mixture. Bring to a boil again, reduce heat and simmer until soft, about 30 minutes or the grains are beginning to get tender. Wash the roasted dals and stir in adding about 1 or 2 cups more boiling water if pongal looks too dry. Cook stirring occasionally until soft about 30 - 40 minutes. Add more boiling water if necessary to get the right consistency - our family likes the pongal creamy and soft. Coarsely grind the cumin and crack the peppercorns coarsely. Heat the ghee in a small pan with the cumin and black pepper. When the spices sizzle and are browned a little and fragrant, pour over the pongal and mix well. Serve hot with Aviyal, Gothsu, Raita, chutneys or pickles. Enjoy!! For a nonfat version, toast the spices without any fat until fragrant, cool and grind coarsely. Sprinkle over the pongal and mix well. The roasted vegetables make for wonderfully tasty and nutritious sandwiches and wraps especially with homemade Pesto. If you roast a few extra veggies, they can be used to make the delectable Tricolor Pasta with them. Use your favorite breads and cheeses to make the sandwiches. Some of my favorite breads are Chapatis(whole wheat tortillas), ciabatta, sourdough, or French rolls, and lavash. I vary the cheeses each week; Cheddar, Jack, Cream Cheese, Goat Cheese, Feta Cheese and fresh Mozzarella among others - all are delicious :). These make great school lunches along with some crunchy sprout salad or chopped salad and a fresh fruit; I put the pasta, salads or veggie slices in a leak-proof resealable plastic bags and include a fork/spoon. Bon apetit! In answer to a good question that came up about the use of cheeses in vegetarian cooking: I am a vegetarian too and use the specific cheeses mentioned in this recipe - they are made with only microbial rennet or are totally rennetless (please check the list of ingredients to make sure). Generally creme cheese, goat cheese, yogurt cheese, etc are made without any rennet. Some rennetless cheeses are available at the regular grocery stores and more perhaps at special markets which offer more healthful products such as Trader Joe's, Whole Food, etc. Coat the vegetables with a small amount of olive oil (1 or 2 tsp) just enough to coat them and place them on oiled baking sheets; sprinkle lightly with salt and freshly ground pepper. Bake at 400 degrees F for about 10 minutes; turn the vegetables over and bake for about 5 more minutes until soft and lightly browned. Let cool, remove from the baking sheet and store in a covered container in the fridge until ready to use. Assembling the Sandwiches: If using slices of bread, toast them if preferred. If using rolls, cut in halves. Spread a little of the Pesto on one side of the bread pieces; add layers of lettuce, herbs, cheese and the roasted veggies as desired. Sprinkle with salt and pepper if desired and cover with another slice of bread and cut in half diagonally. If using chapatis, roll up tightly after filling and cut in half. Wrap tightly with plastic wrap to use in lunch bags. Serve at room temperature with cucumber or carrot slices, sprout salad or chopped salad and fresh fruits or as desired. These are not true bajjis; they probably belong to the pakoda category. Traditionally bajjis are vegetable slices or pieces dipped in batter and deep fried whereas pakodas are made from a dough formed by mixing all the ingredients including finely chopped veggies. I made these recently for teatime to celebrate congenial company. It is an old recipe from Amma and it is absolutely delicious. I have only eaten them at our house so this recipe seems to be another one of Amma's clever creations. Amazing to say the least, Amma was incredibly inventive; if one ingredient was not available, she found a replacement that worked just as well or even better. It is my guess that perhaps she substituted the whole wheat flour for the traditional besan for some reason - I am glad she did :)! Using whole wheat offers a delectable change from the typical bajjis made with besan (chick pea or garbanzo flour). Do include the rice flour for crispness; otherwise the bajjis will be softer. The sprouts add to the crunch too - especially the ones on the outside. The cashews enrich them and take them beyond the ordinary. These bajjis are to live for! Very easy and very quick - perfect for when you want great snacks at a moment's notice - Enjoy :)! Start heating the oil in a Kadai (Indian Wok) or other suitable pan for deep frying. Place all the ingredients in a bowl, sprinkle 1/2 cup of water and mix. Add more water a few tablespoons at a time if needed and mix thoroughly to make a soft dough. The dough should be soft and sticky but not runny like that for Dosas or pancakes. When the oil is hot, carefully drop a tiny bit of the dough into it. If it starts to sizzle and brown within a few seconds, it is hot enough. Take big spoonful of dough and push off little bits of dough (about 1 or 2 teaspoons) into the oil with a teaspoon. The blobs of dough should be ragged shapes to assure a large cooking surface which allows them to cook quickly and also become crispy. Do not crowd the pan. Cook the bajjis for about 3 to 4 minutes turning them once to cook evenly. When they are deep golden brown, remove from oil using a slotted spoon and drain well by placing on absorbent towels. Proceed with the rest of the dough to make more bajjis as described above. If you find that there is too much dough for your immediate needs, you can save it in a covered container in the refrigerator for 2 or 3 days. Serve hot accompanied by any kind of fresh chutneys, pachadi/raita, ketchup, hot sauce, etc. as desired. Note: I generally add the fresh sprouts and/or chopped zucchini to boost both taste and nutrition. You can vary the vegetables such as eggplant, sweet and hot peppers, summer squashes, Opo squash/bottle gourd, etc according to the season or your preference. Sour yogurt is great for this recipe; so if you have some old yogurt with no place to go, it would be perfect here. The white pasta, delectable bright red roasted bell pepper, and the succulent greens make a lovely presentation of the Italian flag colors but includes an international cast of vegetables such as Italian Zucchini, Japanese Eggplant, and Chinese Bok Choy :)! The fact that the vegetables can be prepared ahead of time makes it very convenient. The bell peppers, eggplant, broccoli, and zucchinis can be roasted one or two days before and refrigerated until ready to use. In fact you can bake extra veggies when preparing Roasted Vegetable Sandwiches and save the extra for this dish. Wash, dry and slice the greens and herbs one day before. Then on the day of serving, cook the pasta, the garlic and tender greens, and combine all together. Coat the bell peppers lightly with a little oil and bake or broil until all sides are slightly charred. Put in a brown bag or a container and keep covered to sweat and cool. When cool, hold over a plate or bowl to catch the flavorful juices, remove the stem and seeds and peel off the skin. Keep aside until ready to use. If made ahead, keep refrigerated in a covered container. Cut the eggplants in half lengthwise; slice crosswise diagonally into bite sized pieces. Peel and slice the onions thinly. Combine eggplant pieces and onions with a tiny bit of oil and a pinch of salt. Spread in a thin layer and roast for 15 minutes or until eggplant is soft and lightly browned. While the eggplant is cooking, prepare the zucchini and broccoli. Cut into bite sized pieces and coat with a little oil and sprinkle with salt. Roast for 10 minutes. While the vegetables are roasting, wash the bok choy and the arugula. Slice the bok choy coarsely. Strip the leaves and tender tips of arugula; discard the stems. Peel and slice the garlic thinly. Strip the leaves from the herbs and chop coarsely. While cooking the veggies bring a large pot of water to boil with a Tbsp of salt and stir the pasta in. Bring to boil again and turn heat off. Let the pasta cook covered undisturbed for about 10 minutes or until tender but still firm to the bite. Drain the pasta reserving about a cup of the cooking water. Heat a large skillet or wok with the rest of the olive oil and stir in the red chili flakes. Stir for a few seconds and add the garlic with a pinch of salt and some pepper and cook until they turn slightly golden. Stir in herbs, bok choy and arugula and cook until wilted. Stir in the hot pasta with the cooking liquid and all the roasted veggies into the greens and herb mixture. Stir to combine well. Serve hot with Chile Sauce and freshly ground pepper. It is delicious at room temperature or even cold - great for lunch bags too :)! Variation: Cut the bell pepper in half; remove stems, seeds and membranes. Cut into bite sized pieces. combine with the eggplant and onions with a little of the olive oil (about 1 tsp) and a pinch of salt. Place in a single layer in an oiled baking pan and roast in a 400 degree F oven for about 15 minutes or until soft and lightly browned. All of the vegetables can also be stir fried in batches instead of roasting to make this dish. As the season warms I am longing for lighter foods like simple, crunchy, munchy, sprout salad that is not only healthy, but also delicious. Makes a wonderful snack for lunch bags too! Snacks like these are sold by street vendors all over India. There is absolutely no cooking involved - the sprouts are raw! so the salad goes together very quickly. You can use homemade sprouts or buy them from the store. If you are not a fan of raw sprouts, steam them lightly. Chat Masala is readily available in Indian Grocery Stores. You can use just salt and pepper and a little ground roasted cumin seeds or other herbs/seasonings instead as another option. The vegetables should be diced slightly larger than the biggest sprout used. Place all the ingredients except the lime/lemon in a bowl. Cut the lime/lemon in half and squeeze the juice from one piece over all. Mix and taste. Squeeze the other piece of lime/lemon if you like a tangier salad. Mix and serve right away or chill until ready. 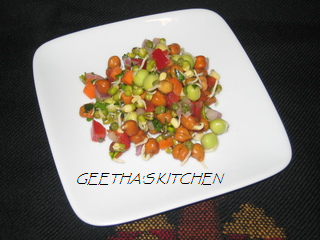 Serve the salad with additional Chat Masala if desired. Variations: An oil and vinegar dressing (or your favorite kind) can be used instead of the lime juice and chat masala. You can also add chopped ripe tomato or other vegetables to the salad. For those who like their food spicy, add a thinly sliced or finely minced hot green chili such as Serrano or Jalapeño. It is very easy to sprout various dried beans and peas. Sprouting does take a little planning though; it takes about 2 to 4 days from start to sprout (in warmer weather the seeds sprout quicker). This is also an educational and fun "cooking" activity for children - they can eat their experiment :) !! As you probably know, children will most likely eat what they help prepare. You don't need any special equipment for sprouting; just any bowl and a clean piece of cloth will do. I like using glass jars for my sprouts; I love watching the progression from seed to sprout. It is fun to have a few types going at the same time. I sprout and store the different types of beans in their own containers and mix them for specific dishes as needed. Sprouts make a nice addition to all types of dishes - salads, Chundal, Bajji, Adai, Corn Cakes, Molakootal, Kootu, stir-fries, curries, etc. One word of caution: some beans such as kidney beans should not be eaten raw as they contain certain enzymes which need to be cooked well in order to make them digestible. Choose one kind of beans/peas or a few at a time; sprout the different kinds in separate containers as the sprouting time varies for the different types. Sort the beans and remove discolored ones, stones, etc. Wash thoroughly in two or three changes of fresh water and soak in plenty of water to cover in the container of your choice. Leave the beans/peas to soak overnight or even up to 24 hours at room temperature. Rinse the soaked beans/peas and drain thoroughly. You will see that the well hydrated beans/peas will be plump and lighter in color than the dry. 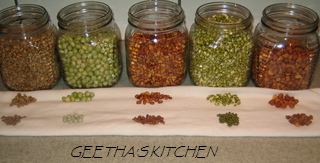 Rinse the beans/peas with fresh water twice a day; once in the morning and again in the evening. Little white sprouts will emerge in a day or two. When the white sprouts are visible in pretty much most of the beans/peas, wash and drain well and start using them in your favorite recipes. Yields about 1 to 11/2 cups of sprouts - the larger the size of beans/peas, the more sprouts. Caution: I find that some Mung beans do not sprout or even hydrate and remain hard; so I check to make sure all the beans have sprouted before adding to dishes. but those in the white bowl stayed rock hard! There is a very easy way to remove the hard beans: just place all the beans/peas in a large bowl with plenty of fresh water; the hard ones stay sunk at the bottom while the sprouts float. I just remove the top layers of the sprouts for salads and snacks and save the hard ones on the bottom for soaking longer or cooking. The other way to remove hard, unsprouted legumes is to sort them on a large tray or baking pan; this can be done quite easily and quickly.